Sailing education is necessary learning process organized in courses within the targeted program which could be conducted in classes as well as practical application in any sailing schools. Our education center, Sailing School Malaysia, which established in the year of 2012 offering sailing lessons to youth, students, any member o f the community in group of 5 with applicable reasonable rates of prices designed from basic knowledge like introduction of sailing to advanced levels of to be a skipper inclusive of crew certification. Our experienced instructors provide valuable information during the training classes of safety, navigation, nautical knowledge in the fun environment. 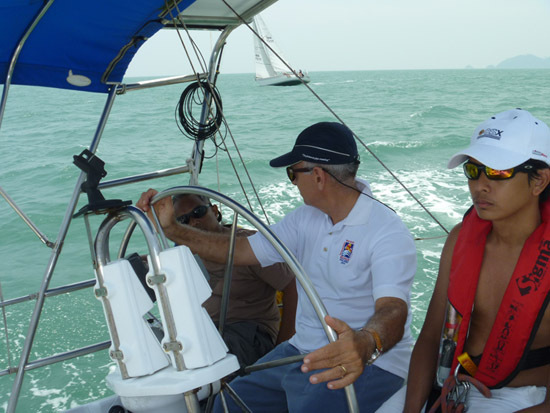 Our practical training related with organized courses is done in yacht or sailboat. Students who join the team learn the organization of the boat, company of friends during the cruise, which is always practiced by our coach instructor in a way of making hobbies into the high standard of safety in marine environment including to develop the skills. Flow of the training during the cruise is always prepared like puzzle while observing incoming traffic, which provides millions of different decision making and judgment opportunity to the students, which is necessary ability to be developed by the sailors on the water. We believe that if they develop this valued high skills in them personally during early stages of sailing education, they would be competitive in the marine environment either it would be links of any sea sports, start racing, world of regatta or association with the sea operation of any kind. Our powerful policy, founded on the principles of sound and safe services set to adapt any adult or children of age between 15 to 18 who want to participate our program as a volunteer together with their parents, is to build these people self confident sailors at the end of the program. When they are entitle to have certificates of their respective courses, they will be a sailor of sound judgment, strict obedience of rule of the seas, which are highly required from all sea going people around the home country and in the world of marine environment. This will be safety not only for their own self but also for the others. When these kinds of products of sailors in the circulation of seas, we believe that we contribute safety of the seas through the sailing education.